The rose Dream Weaver was first bred in the United States in 1998 by Dr Keith Zary. Dr Zary is most notable for his two award winning roses, the Greetings rose, and the Terra Jubilee rose; with a third as of yet unnamed rose giving him his third award. 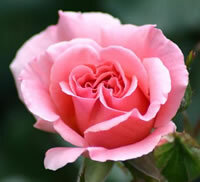 Dream Weaver was created by crossing the Pink Polyanna rose with the Lady of the Dawn rose. 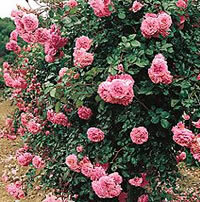 The result was a fantastic pink perpetual bloomer that suits itself well to almost any of your landscaping ideas. Dream Weaver roses will thrive in zones 6 through 9 and can reach heights of 10 to 12 feet tall at full maturity. 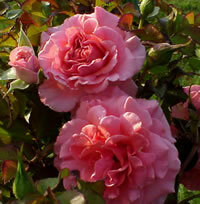 The pink blooms will average about 3.5 inches in diameter and will give off a somewhat moderate rose scented fragrance. The blooms of the rose Dream Weaver will be only somewhat full, containing up to 30-40 petals each. This climbing rose is often grown around porch pillars and trellises along pathways and it has proven to be a very vigorous grower. Dream Weaver is also highly resistant to diseases, especially mildew and rust. Growing the rose Dream Weaver is not terribly difficult and you can make it a lot easier and far less frustrating if you give your roses the proper growing conditions. To start, you will want to choose a site for this rose that gets a lot of sun light. A good rule of thumb is to give your roses at least 6 to 8 hours each day of direct sun light. If you can provide them with more, then all the better. I have found some of the best locations for planting roses are the ones with exposure to the morning sun light. Planting your Dream Weaver roses with morning exposure helps to dry out the morning dew faster, which keeps the leaves of your roses healthier. You should also see to it that the soil you plant them in drains well. Typically roses will perform very poorly if the soil stays soaked for long periods of time. Your rose Dream Weaver will also be healthier if you can choose a location where the natural air currents through your garden can also move through the leaves of the rose. This also aids in keeping the leaves dry. Getting your rose Dream Weaver into the ground is not as difficult as some people think. All you need is a little bit of time and a few basic hand tools. The first thing I always recommend to growers before they start digging is to take a trip to their local garden center and pick up a bag of a good organic compost. This stuff makes a great soil amendment and when you dig your hole, mix it in with the loose soil at a ratio of 1 part compost for every 2 parts soil. How you go about planting your Dream Weaver roses depends a little on how and where you purchased them from. If you picked one up locally then it was most likely already established in a container. These are the easiest to plant because all of the guesswork is done for you. You should dig a hole that is at least twice the diameter of the container and equally as deep. This gives you plenty of room around the root ball of your rose Dream Weaver for your new soil mix while still keeping the bud union at the same depth it was planted in the container. If you ordered your rose Dream Weaver online however, they probably shipped it to you as a bareroot plant. The first thing you should do is soak the plant overnight in a bucket of lukewarm water to help rehydrate the plant. Then dig yourself a hole that is as wide as the longest roots on the plant, and deep enough to allow you to set the plant atop a mound of soil while still keeping the bud union about an inch or two below the surface of the soil. Once you have your rose Dream Weaver in place, spread the roots out in all directions around the mound and then back fill the hole halfway to start, using your new soil mix. Take the garden hose and water the loose soil heavily until it flows around the roots like mud. Go ahead and fill the hole the rest of the way and then give the soil one last heavy watering, topping off any final settling that may occur. This method should ensure that no air pockets have formed around the roots. As a final step, it is recommended that you mound up some mulch around the exposed canes until new growth has formed. This should prevent them from drying out and you can remove the mound after the new growth has formed. Taking care of the rose Dream Weaver is actually pretty easy and you can follow normal rose bush care guidelines. You will need to provide your roses with adequate water but be careful not to overwater them. A good rule to follow here is one deep watering per week for most climates. If you live in a hot or dry region then you might have to step that up to every 4 to 5 days. You can also give your Dream Weaver roses a dose of an all-purpose granular fertilizer in early spring when the leaves start to form. Because this is a continuous blooming rose, it will benefit greatly from additional feedings over the course of the growing season. I will usually give my roses a second feeding just before the first big bloom and then a third feeding later on in the middle of the summer to encourage late season blooms. 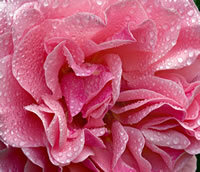 You should prune your rose Dream Weaver in the early spring before the leaves start to bud. Start by removing all the dead wood as well as any canes that are discolored from disease. Next, prune back any overlapping canes as these will compete with one another for sun light once the leaves open. 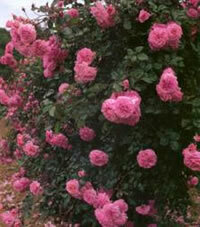 Lastly, give your climbing roses a light pruning for shape, and to encourage new growth. This is also a great time to rake up around the base of your Dream Weaver to clean up all the dead leaves and debris that may have collected there from the previous growing season. Throw all this material away in the trash, along with your cuttings. Never let decaying matter lay around your roses as these can turn into a breeding ground for various pests and diseases. I always finish up my pruning by giving my roses a fresh layer of mulch to start off the new growing season.